In previous installments we have established that “taxes drive money.” What we mean by that is that sovereign government chooses a money of account (Dollar in the USA), imposes obligations in that unit (taxes, fees, fines, tithes, tolls, or tribute), and issues the currency that can be used to “redeem” oneself in payments to the government. Currency is like the “Get Out of Jail Free” card in the game of Monopoly. As Warren puts it, taxes function first to create sellers of real goods and services, and have further consequences as well, including what falls under “social engineering,” which are political decisions—something we’ll discuss a bit more below. Economic pundits who predicted the collapse of the euro at the start of the eurozone crisis have been proven wrong. But those who say the crisis is over are equally wrong. Four years after the start of the euro crisis, the bailed-out countries of the eurozone (Greece, Ireland, Portugal, and Spain) are still facing serious problems, as the austerity policies imposed on them by the European Union (EU) authorities and the International Monetary Fund (IMF) not only failed to stabilize their economies, but actually made matters worse; in fact, much worse: the debt load increased substantially, national output was seriously undermined, unemployment reached potentially explosive levels, a credit crunch ensued, and emigration levels rose to historic heights. Because of these highly adverse effects, the citizens in the bailed-out countries have grown indignant and mistrustful toward parliamentary democracy itself, euroskepticism has taken firm roots, and a cleavage has reemerged between north and south. Take unemployment, for example. The current unemployment rates in the four bailed-out eurozone countries are: 27 percent for Greece; 25 percent for Spain; 15 percent for Portugal; and 12 percent for Ireland, the nation with the highest emigration rate in all of Europe, and whose government was actually asking the unemployed recently to leave and take jobs in other European countries. A similarly dramatic picture emerges when one looks at current government debt. In Greece, it ballooned from slightly less than 130 percent in 2009 to 175 percent at the end of 2013 and it still growing. Ireland’s public debt, which stood at 25 percent of GDP in 2008, grew to nearly 65 percent by 2010 and climbed to over 125 percent by the end of 2013. Portugal’s public debt, which was slightly less than 70 percent in 2008, jumped to over 100 percent by 2011 and then to over 130 percent by 2013. And Spain’s public debt has surged to nearly 95 percent of GDP, standing at close to 1 trillion euros—three times as much as it was at the start of the crisis in 2008—and is projected to go over 100 percent by the end of 2014. In short, the rest of the bailed-out eurozone countries are looking more and more like Greece when it comes to public debt—the result of the “voodoo” economics that the witch doctors of the EU and the IMF cooked up in order to formulate the so-called “rescue” plans. The prospects for real growth in the periphery of the eurozone are grim as the EU’s current economic mindset, a set of economic dogmas that include (1) relegating unemployment to the status of a natural and inevitable (and perhaps even desirable) outcome of fiscal adjustment, (2) relying on austerity as a confidence builder, (3) treating structural reform as a panacea and (4) valuing exports as the primary engine of growth trump serve to impede recovery. Is Inequality Holding Back the Recovery? In their latest, Dimitri Papadimitriou, Michalis Nikiforos, Gennaro Zezza, and Greg Hannsgen begin with a familiar point: the Congressional Budget Office has been predicting fairly rosy economic growth rates for the coming years (rising to 3.4 percent in 2015 and ‘16)—rosy, that is, given the CBO’s expectation that government budgets will remain tight, and get even tighter, over this period (with the federal budget deficit shrinking to 2.6 percent of GDP by 2015). As Papadimitriou et al. point out, the only way to make these growth and budget forecasts both come true, assuming there are no significant changes in net exports (a safe assumption), is if the private sector substantially increases its indebtedness. There really isn’t any other option. If we don’t see a return to ballooning private debt-to-income ratios, then either government budgets will have to be loosened or we won’t get the growth rates the CBO is telling us to expect. Now, there are reasons to think that the reappearance of accelerated growth in private debt is unlikely (a theme the authors dealt with in their last US strategic analysis), but if it does happen, rising private debt ratios—which played the starring role in the financial crisis from which we’re still recovering—might destabilize the financial system. This is one sense in which maintaining tight government budgets over the next several years should not be portrayed, as it all-too-often is, as the “prudent” course of action. [O]ver the last 30 years not only was there a sharp increase in the level of household debt but a disproportionate share of this debt was incurred by the middle class and the poorest American households. 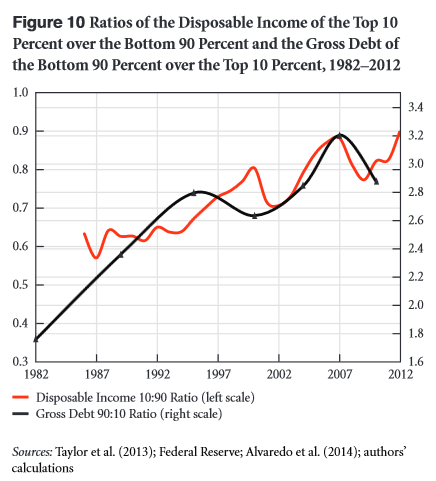 Moreover, there seems to be a strong correlation between the two variables: as the disposable income of the top 10 percent of the population increased relative to the disposable income of the bottom 90 percent, the gross debt of the latter rose relative to the debt of the former. Going forward, the current stance of public policy (including, but not limited to, tight fiscal policy) de facto requires a rise in household debt—borne entirely by the bottom 90 percent of households—as the only path to modest economic growth rates (in the range of CBO’s 3.1–3.4 percent). If, on the other hand, the bottom 90 percent of US households continue to “deleverage,” lowering their debt loads, then the authors show that we’re more likely to see economic growth fall to a piddling 1.7 percent by 2017, with unemployment rising to 7.6 percent. Read the report: Is Rising Inequality a Hindrance to the US Economic Recovery? This sounds shocking because we are so accustomed to thinking that “taxes pay for government spending.” This is true for local governments, provinces, and states that do not issue the currency. It is also not too far from the truth for nations that adopt a foreign currency or peg their own to gold or foreign currencies. When a nation pegs, it really does need the gold or foreign currency to which it promises to convert its currency on demand. Taxing removes its currency from circulation making it harder for anyone to present it for redemption in gold or foreign currency. Hence, a prudent practice would be to constrain spending to tax revenue. 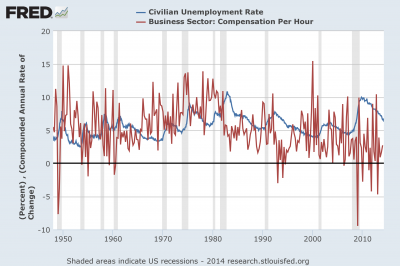 Phillips Curve Still Alive for Compensation? On reading a recent post by Ed Dolan at Economonitor with some evidence of the lack of a strong Phillips relationship for consumer-price inflation in US data, it occurred to me to try a measure of total compensation per hour with recent data. 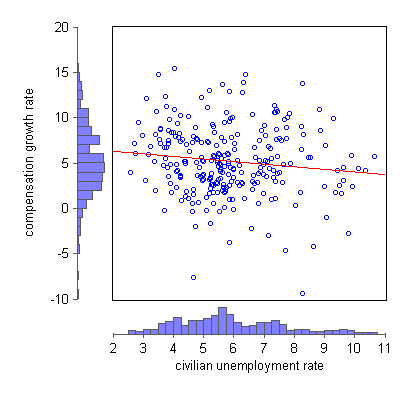 The wage relationship estimated over all available quarters, using averaged monthly observations for the civilian unemployment rate, is shown above, with a scatter plot and an estimated regression line. Like the relationship estimated by Dolan, the regression line above suffers from a rather loose fit (constant: 6.87; slope coefficient: -.29; R-squared = .02). A complete explanation of inflation is complicated and of course also involves other costs, including raw materials such as fuel. The latter costs are subject of course to “cost-push”-type inflation at times, as are wages. Exchange rates of course affect these costs. By the way, if inflation were to become a large problem (and it seems well-contained now), non-recessionary methods exist to try to alleviate it. Even where the Phillips-curve relationship is strong, the human costs of using it to combat inflation are usually very high, given the existence of alternative policies that could perhaps be given a try in the US. Greece Has Returned to the Bond Markets—Mission Accomplished? C. J. Polychroniou: After four years as the pariah of the financial markets, in the course of which 330 billion euros was granted/guaranteed in international bailouts in order to avoid an official bankruptcy, Greece has made a successful return to the international bond markets. Why did Greece return to the bond markets now when the country’s debt-to-GDP ratio is much bigger than it was back in 2010? Dimitri B. Papadimitriou: The return to the bond markets was an act of pure symbolism. The government purposely made the success of the austerity program dependent on achieving a primary surplus as opposed to the return to growth in output and employment. Recall that the idea of expansionary austerity embraced by the country’s international lenders was spectacularly discredited. Thus, the Troika (IMF, EU and European Central Bank ) and Greece’s compliant government needed to invent a new metric of success, and it was associated with achieving a primary surplus as large as it could be so that financial markets can be impressed. However, no one else is impressed, especially the international lenders, for three main reasons: (1) The primary surplus was achieved by a one-off (non-recurring) excess revenue from the gains of Greek bonds in the portfolios of Eurozone’s central banks and the European Central Bank’s (ECB) holding that were returned to Greece; (2) collections of old tax revenue; and (3) non-recurring spending cuts and delayed payment of the government’s debt to the private sector, whether VAT refunds or non-payments to private sector vendors. Finally, the return to the markets was costly to the country — the apparent low interest rate of 4.95% notwithstanding — since the interest rate of the funds borrowed from the European Stability Mechanism (ESM) is at a very much lower interest rate. To be sure, the hedge funds and the private sector [parties] buying the new bonds knew that there was an implicit guarantee from the ECB that would accept these bonds under its Outright Monetary Transactions (OMT) program. So the bonds were not backed by the progress of the Greek economy — it would be ludicrous to assume so, for an economy in continuing recession and increasing debt to GDP ratio, especially if its credit rating is still below investment grade. So, all in all, it was an act of desperation and a strategy to give the government extra help in the soon-to-be-held local and European Parliament elections. CJP: Radical structural reforms, which include labor and product markets and blanket privatizations, constitute the second component of the conditions behind Greece’s bailout plans. First, is there in economic literature a direct connection between labor market flexibility, productivity growth and national economic performance? DBP: The economic literature, as economists know, can produce conflicting results. It will not be surprising to find cases when statistics will prove that there is a positive outcome in terms of increasing productivity with flexible labor conditions, but this is always dependent on the level of technology diffusion. To be sure, German workers have the highest productivity in Europe along with those in the Netherlands, but it is not because they are paid less than other Eurozone workers but because of the high level of effective technology used. So they are about 70% more productive as compared to Greeks, Portuguese or Spaniards despite the fact that the latter work substantially many more hours during the week. Clearly, Germany’s and other North European economies enjoy better economic performance, but this is not due to so-called labor flexibility only. Germany is successful because it is lucky, having an extraordinary number of idle and low-wage workers from East Germany when the unification took place. Unification gave Germany the ability to hold West German wages down. But this should not be used as an example of a successful application of a labor flexibility policy. The literature also abounds in studies showing that labor productivity is not dependent on labor flexibility. Indeed, the theory and policy of “efficiency” wages, promoted by none other than Nobel Laureate George Akerlof and current Fed Chair Janet Yellen, is part of the economic research which shows there are productivity gains and other positive outcomes to firms which pay higher than market wages. All in all, then, the argument of flexible wages does not, I am afraid, hold water. Read the rest of the interview at Truthout.